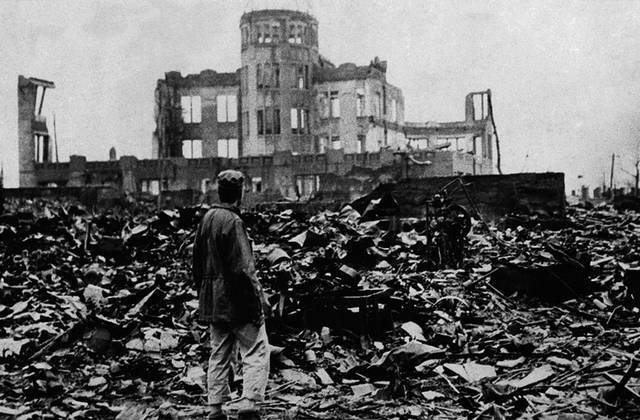 The first and most blatant time we used atomic bombs was, of course, on Hiroshima and Nagasaki, Japan, at the end of World War II. We were told the bombing was justified because it forced an early end to the war with Japan and consequently saved many thousands of lives of both allied and Japanese soldiers. This argument, however, has since been proven wrong. Peter Kuznick, Director of Nuclear Studies Institute at American University, in an interview with Edu Montesanti for Global Research, said "the reality is the atomic bombings neither saved American lives nor did they contribute significantly to the Japanese decision to surrender. They may have actually delayed the end of the war and cost American lives. They certainly cost hundreds of thousands of Japanese lives and injured many more." Kuznick said that "few Americans realize that six of America's seven five star admirals and generals . . . are on record as saying that the atomic bombs were either militarily unnecessary or morally reprehensible or both." Admiral William Leahy, chief of staff to President Truman, said the bombings of Japan were in violation of "every Christian ethic I have ever heard of and all of the known laws of war." He said the Japanese were already defeated and ready to surrender when we dropped those bombs. It is on record that the Japanese military was already negotiating for peace. The only hold-up was the Japanese insistance that Emperor Hirohito be spared the indignity of a trial for war crimes. The people of Japan regarded the emperor as a sacred figure. As it turned out, General Douglas MacArthur negotiated a final peace deal with Japan that gave the people what they wanted. Emperor Hirohito was not tried for war crimes. He remained in power until his death on January 7, 1989. General Eisenhower said it was known that the Japanese were defeated before we bombed them. MacArthur said he felt the Japanese would have surrendered months earlier if the question of what to do about the emperor had been resolved. Because allied forces had broken Japanese codes and were intercepting Japanese messages, the military was fully aware of Japan's desperation to end the war, Kuznick said. He said what the Japanese really dreaded was the possible invasion by Soviet forces, which was looming. So why did Truman order the use of atomic bombs? Apparently it was all about politics and plans by the United States to deal with Stalin's red army after the war was over. While the Soviet Union was an ally during the war against Germany and Japan, it was not considered a political friend of Europe and the United States. Thus U.S. forces used the bombs as "a stern warning to the Soviets of what was in store for them if they interfered with US plans for postwar Hegemony," Kuznick said. Thus the bombing became a major factor in launching what became the Cold War against the Soviets, and the military campaigns against North Korea and North Vietnam. It has since been well documented that the United States has used explosives in Iraq that either contained small and controlled atomic warheads or contained radioactive materials. Many soldiers were reportedly exposed to uranium tipped bombs and waste materials. They said Cesium 137, cobalt 60, strontium 90, americium 241 and barium 133, all radioactive waste, were detected in the war zones. That means much of Iraq has been laid waste to radioactivity which is poisoning the people who live there. Readers of this site may also have seen the report by writer Paul Kincaid, who outlined strong documentation that nuclear cluster bombs planted at the base of the elevators in the World Trade Center buildings, were the cause of the total destruction of the buildings on 911. Thus it appears that our government may have used atomic weapons against ourselves.